ViewRanger GPS app now available on Kindle Fire tablets! ViewRanger is now available to download for Amazon Kindle Fire tablets and other Android smart phones & tablet's using the Amazon Appstore. ViewRanger helps outdoor enthusiasts to plan, navigate, and share their outdoor adventures, be it walking, cycling, skiing, riding or many other sports. 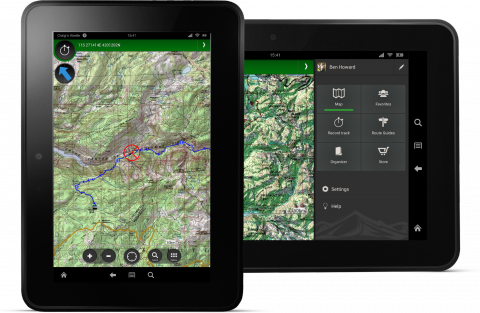 ViewRanger for Kindle Fire comes with free and unlimited access to a range of maps including OpenStreetMap, OpenCycleMap, and Bing Aerial imagery, that can be stored on your Kindle Fire or other android device for offline use. You can also purchase premium topo maps from USA USGS and other national mapping partners for over 22 countries around the globe, covering most European countries, Canada and New Zealand from within the app. You can also search and download thousands of trail guides that the app will navigate along, many including detailed information and photos. More than 400 brands have trail guides available to download alongside trail guides shared by ViewRanger users. Our free to use companion website my.viewranger.com allows route plotting and recorded GPS track analysis from a larger desktop screen. It is easy to synch route guides and recorded GPS tracks between the ViewRanger app and the MyViewranger website, and you can view, comment and ‘like’ your friends' adventures both on there and the app. The new user experience within Version 4.0 of ViewRanger means that the app’s key features – advanced active navigation, access to trail guides from across the world and the ability to record and share location-based adventure content online – are now just a finger-swipe away. The app is available to download for free from Amazon Appstore right now!